Before I get to my progress and goals this week I'd like to take this Earth Day to share some sad statistics about plastic. Plastic has invaded the oceans, the mountains and even Arctic ice. Here's some info from Ocean Conservancy, specifically, an article on trash free seas. "From plankton to whales, animals across ocean ecosystems have been contaminated by plastic. Plastic has been found in 59% of sea birds like albatross and pelicans, in 100% of sea turtle species, and more than 25% of fish sampled from seafood markets around the world." Hum, am I getting a side of plastic with that shrimp I love? Or maybe my fish tacos should be named fish and plastic tacos? Plastic is being ingested by ocean creatures. And, we enjoy eating them. This is another reason to clean our oceans, lakes and rivers of plastics. It's time to really reconsider our love of plastics and start looking at what we as individuals can do to help contain plastic. You can read about the research being done on plastics in our marine food chain at National Geographic. 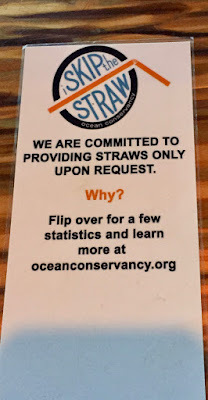 My closest friends have mentioned they hesitate to take a straw when we go out to meals together. A start but I really wish they would think about it all the time not just when we are together. 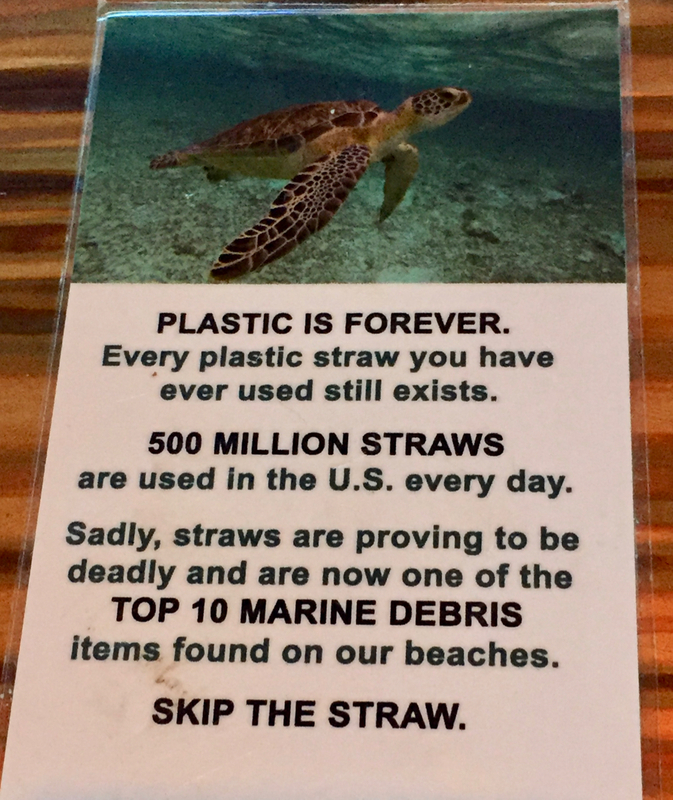 Another friend has bought collapsable, reusable straws for her family. My next attempt at making a difference was to bring my own metal silverware to our neighborhood's monthly pot luck instead of using the supplied single use plastic knives, forks and spoons. It's easy to wrap a set of silverware in a cloth napkin and bring them with us. We've convinced another couple to do the same thing. The more I talk about it, the more likely it is that others will start doing the same thing. It's so easy to carry your own. Does one of these ideas seem easy to you? If so please help our oceans by changing some habits. 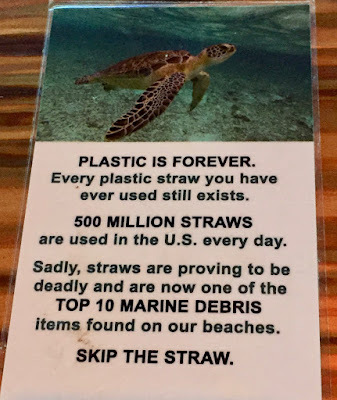 It's pretty easy to skip using a straw every once and a while or all the time. 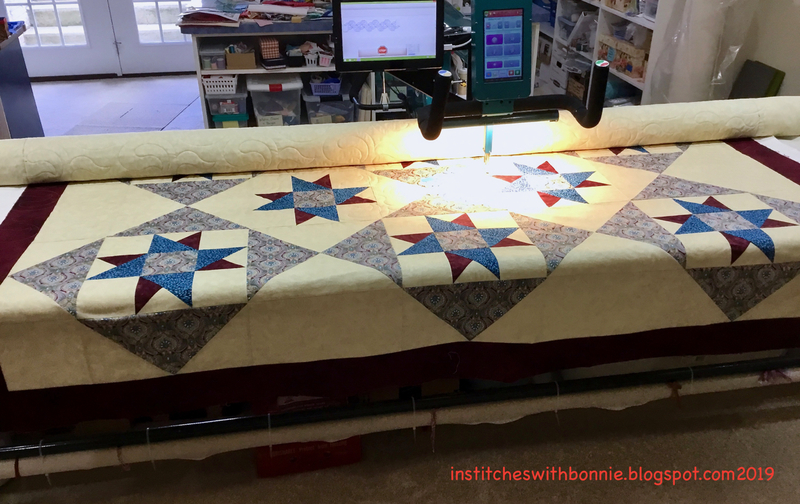 Now back to our regularly scheduled quilting blog! I spent most of this week wrestling with a quilt called Mystery of Powhatan. It was a mystery, it was fun, it's attractive, but we had no idea how big it was going to be! And, that answer is HUGH once the whole quilt was done. After I finished it I stashed it in the "to be quilted" closet as I didn't really need another queen size quilt. Fast forward to Hands 2 Help 2019. One of the suggested recipients is Carolina Hurricane Quilt Project. They are looking for twin, full and queen size quilts. Hum, I'd already bought a wide back for the quilt. Yes! Time to get this out and quilt it. Except, with the two borders it is bigger than the wide back I purchased. So, I decided to take off one of the borders and make it narrower. Or so I thought. So, then I decided to take off the inner border and just not use it. In the end I took 4" off each side and it still is a healthy 81 x 104ish inches with the final border smaller. I carefully measured the backing. It would be really close especially when 5 or 6" would be used to clamp the backing to the rollers of Ruthie, the long arm. So I sewed some additional strips of fabric on the top and bottom of the top so I could clamp the excess fabric and have enough for the backing. All right. Let's get this quilt done. Um, not so fast. I have been basting my quilts to the batting and backing instead of just letting the batting and top float over the rail. Good thing I did that because the batting was about 3" too short for the quilt top. OH GOOD GRIEF! Easily solved but not all that quick. I trimmed off the batting on one side as I worked down the quilt. Then I used that piece and hand stitched it to the end of the batting. And then, I let Ruthie do the rest of the magic and it is now quilted. 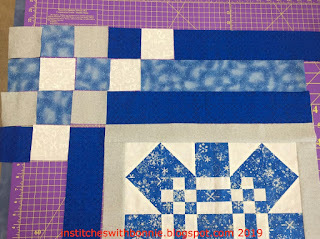 Later this week I'll figure out the binding hopefully using the excess I cut off of the border. If not, I don't know what I'll do for a binding.... I'll take a better picture when I get it bound. I made it through all of my goals this week. 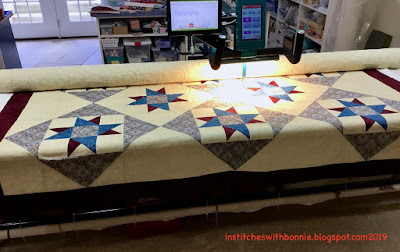 The hand quilting part was a very short time but I did get some work done on it. There's still 4 more sashing pieces needed between the rows of granny blocks but at least progress is being made on all fronts! Have you ever succeeded in getting 4 lively grandchildren to stand up nicely, smile (without making monster faces or sticking tongues out) and generally look put together for a group picture? Well, no, neither have I recently. But I did catch this picture of them being swung on a hammock today. They were having a blast. From left to right Sophie, Theo, Ellie and Natalie: cousin fun. I'm linking up with my regular Monday parties: Oh Scrap, Monday Making, and Moving It Forward. You know the drill -- I'll come back tomorrow to link up with parties that haven't started yet. And, yes, I will definitely be spending time blog hopping this week. On Saturday my design wall looked like this. I laid out both sets of Friendship Star blocks and decided it made a lot of sense just to sew them together. I've ordered some red to use as a backing. There is a good likelihood they will be done in the next month or so. Both will be given away. I've got a few things on the side of my design wall that probably should be either done or taken down. Don't hold your breath on either of those things happening. 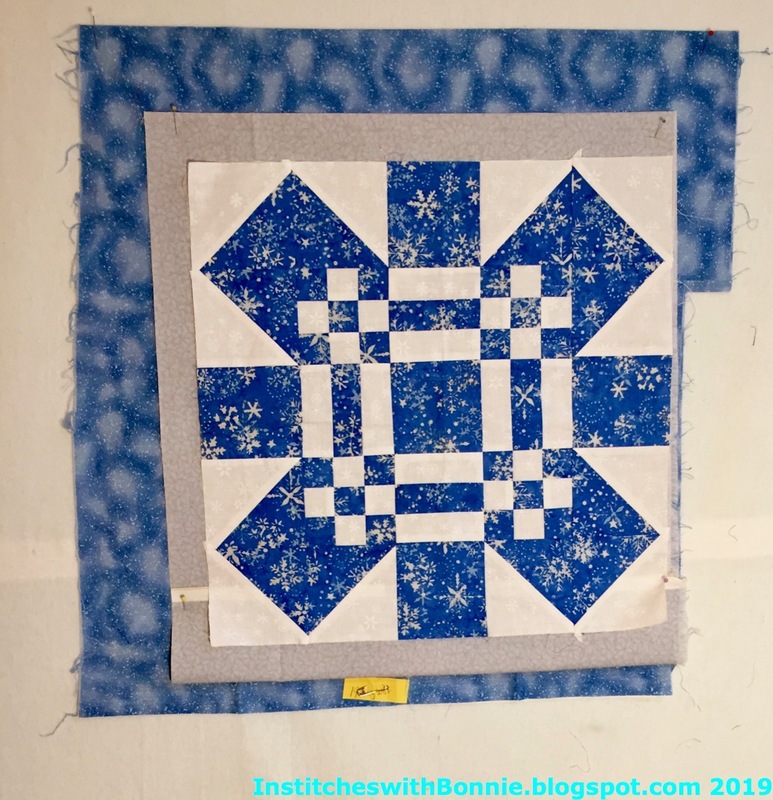 Today I worked on this snowflake block. Ugh... not happy with my original plan. This is going to Jack's Basket as part of Hands 2 Help. 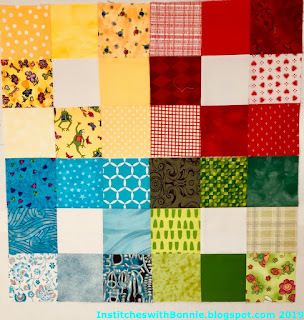 They are looking for smaller quilts -- 36" square approximately. The snowflake and the grey border are about 18" so I thought the corner 9 patches and border would bring it up closer to 36". I often ask Sharon or Beth for advice on quilts that are not going together well. Sharon nixed the softer blue -- too blah. And the 9 patches are out of scale with the original block. Darn, I hate it when she is right. Back to the drawing board. I'm going to see what else might go around that block. Hum, what are the chances of me having any snowman fabric in the right color? So this one needs to stay on the goals list this week. My goals list did a great job of keeping me focused this week. Everything got moved forward. Pick a UFO to work on√ actually, sewed the blocks together so they go in the to-be-quilted closet. This coming week I'll continue to focus on my hand quilting even if only for a couple of hours. I don't have much going on this week so there is a good chance I can get a good start and perhaps finish some of these items. 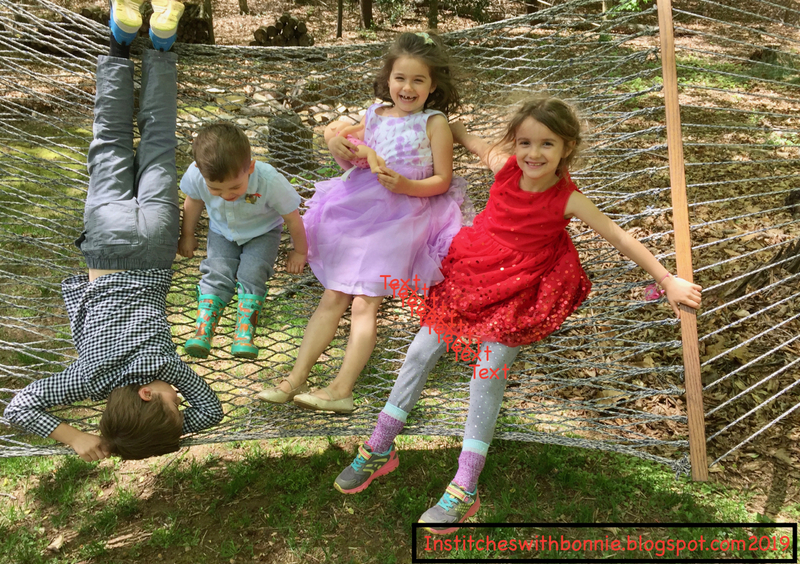 I'm linking up with my regular parties: Oh Scrap, Monday Making, Main Crush Monday, and Moving It Forward. I'll check back later to add the other link. I enjoyed time checking other blogs. It's addictive and I come away with so many great ideas. Hope you check out a few too. 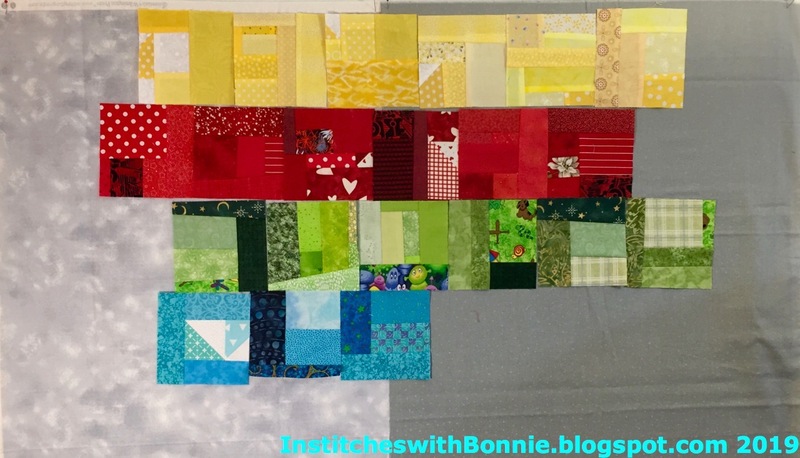 This year I've gone wild with the Rainbow Scrap Challenge. I'm not sure why I am making 3 different block sets but I am. Since I rarely post about the blocks I thought I'd drag them all out and show all of what I am making for the RSC. First up a single block each month. This is called Bright Block by Ravenna87. (I'm sorry to admit I have no idea where I got this from.) It's not very exciting yet but wait til I get some sashing and the flying geese border. It is really cute. Next up is a Propeller Block. I used one that Jan at The Colorful Fabricholic gave directions for. And, if you click on Newer Posts at the bottom of the post it will take you to her next post where she shows several ways you can lay out the block. I started the first two months by making 4 of the blocks but for some unknown reason I went to 3 for March. 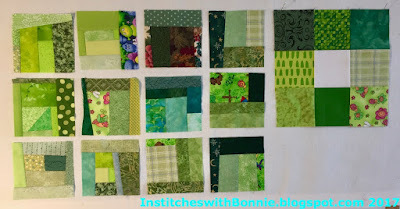 I may go back to making 4 blocks just so I have lots of blocks to play with when I'm ready to make a quilt or 3. 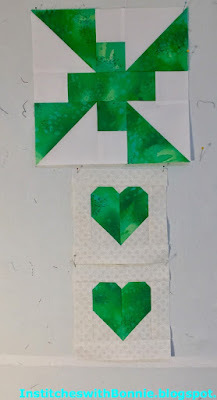 By the way, that top left block is actually a dark green with light green swirls in it. 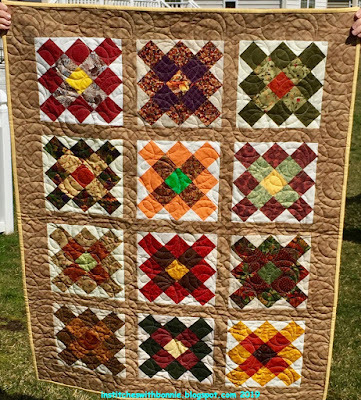 It may not make it to any of the final quilts. My last set of blocks is based on Stash Statement by Kelly Young. You can see the pattern I'm using here. It's been a lot of fun to make these blocks -- I'm making them oversized and then trimming to the size needed. In these pictures I'm trying to get an idea on the color of background fabric I want to use. 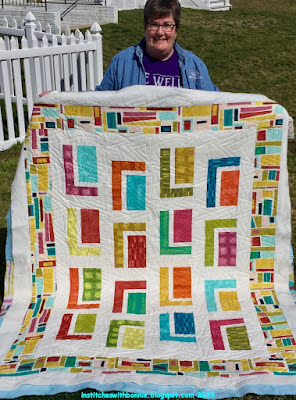 I will probably make the quilt smaller than the one Kelly features. I like the fabric on the left but I don't have enough. The fabric on the right is too dull for these pretties. And below is a definite NO! in my mind. I may have a hard time using that fabric for anything. One of these days I'll take the blocks to a quilt store and audition fabric for the backing. I could actually being making the rows each month and be well on the way to a finish by the end of the year. Before I lose my opportunity to link up to the One Monthly Goal at Elm Street Quilts here's my goal for April. You may be asking yourself what I'm going to be working on -- Pillow Shams. Not my favorite activity but our bed and Sea Glass will look so much better with turquoise pillow shams instead of boring white pillow cases. 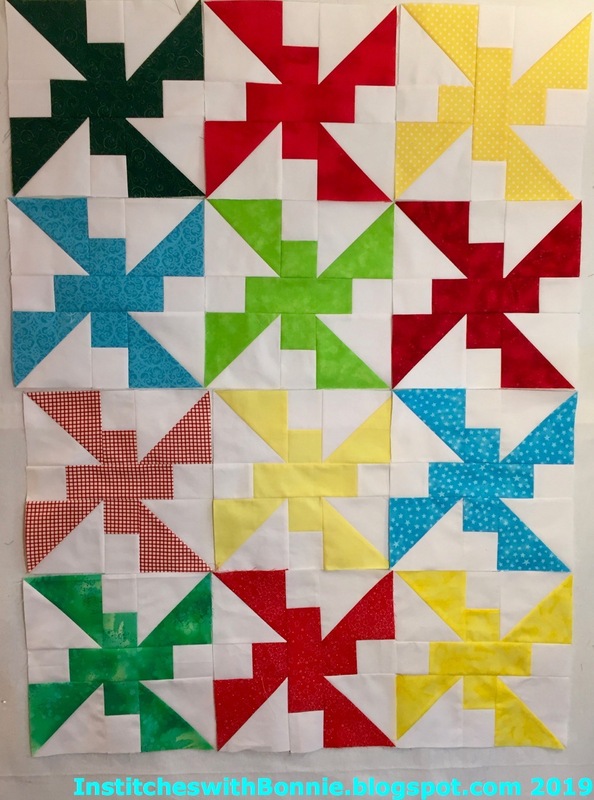 My plan is to set Ruthie to quilting designs on the center rectangle and then finish off the shams. I'm tired of all the white in the bedroom so I'm pretty darn sure I will finish these this month with no problems! 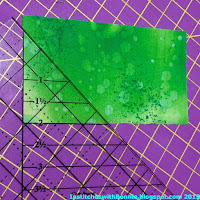 I'm linking up with Elm Street Quilts' April Goal Setting Linky Party and SOScrappy's Scrap Happy Saturday. 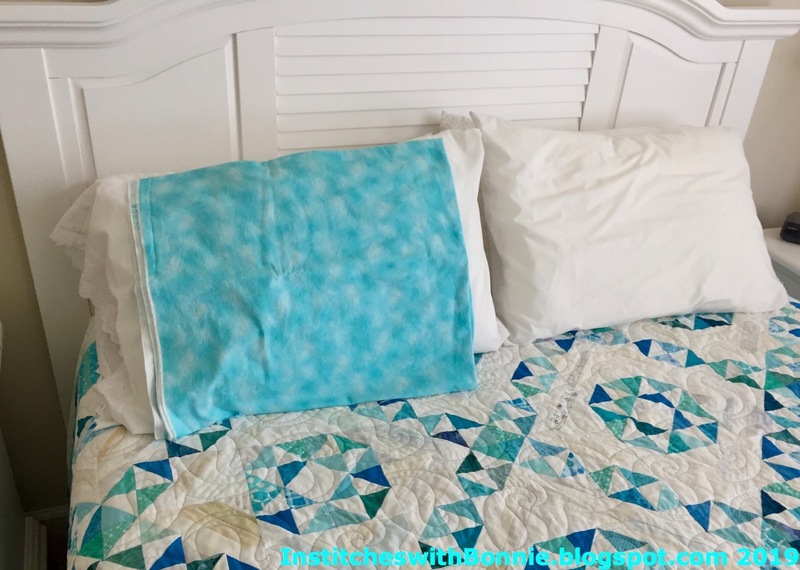 (Hum, interesting how my pillow shams work right in with the Aqua at RSC this month.) I'm ready to finish my goals for this week so I'm heading down to the studio. I need to sew! Did March seem really long to you or was it just me? I am definitely ready to move on to the next color on the Rainbow Scrap Challenge although I admit I still need to make 2 more of my propeller blocks in green. Here's the one I made Sunday night. I only did one because I find if I'm making mistakes when I sew at night it is better to just quit and give it a rest. The bottom two hearts will be going to Angels in Gumboots. 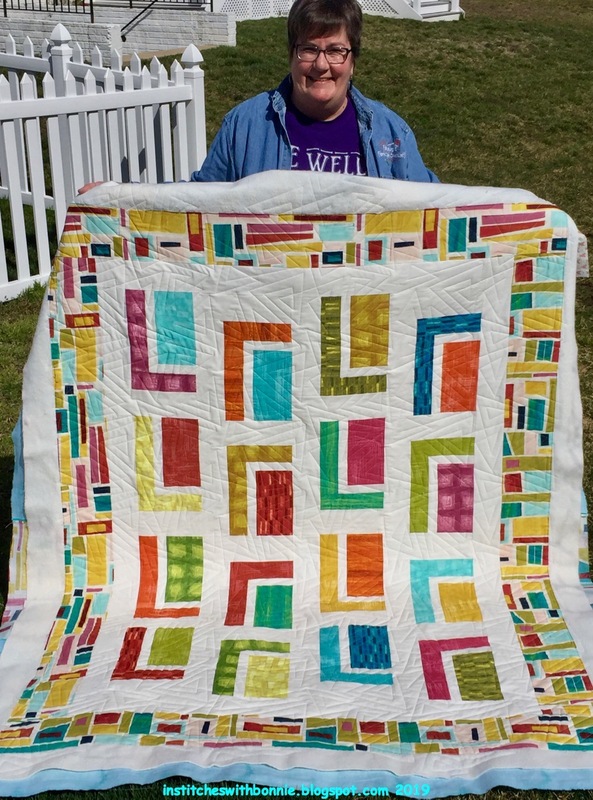 Their goal is to make 50 quilts for survivors of the shooting in New Zealand. 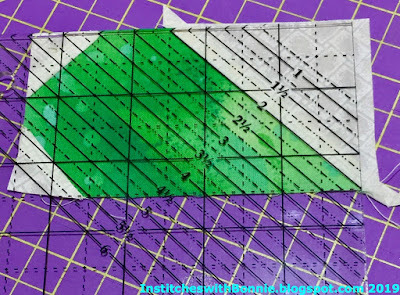 Check out the directions and other information on The Joyful Quilter Blog. The blocks finish at 6.5". If you read through all the information you will see that some colors and fabric designs would not be appropriate. Also at the bottom you see you can mail your blocks to Joy with a dollar or two to help defray the postage costs and she'll mail them on. Thank you Joy for making it so easy for us to help with this project. I started making these blocks tonight and yes, I did make a mistake or two but I decided I wanted to finish the two I started. But here's the brilliant thing I did. 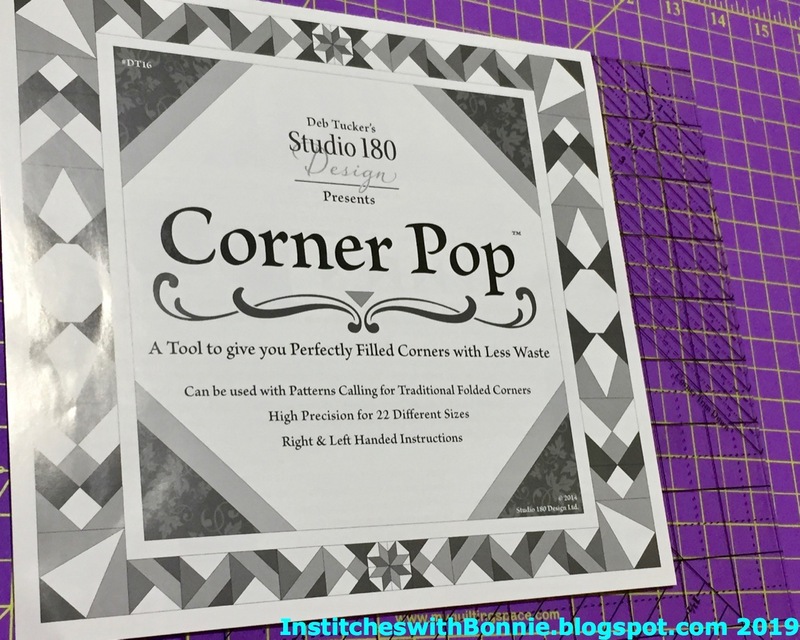 At the Mid-Atlantic Quilt show I purchased a Corner Pop ruler by Deb Tucker or Studio 180. As I was making these I realized the ruler would help with the lower triangles. Brilliant. Earlier in the week I watched a video about using the ruler. It seemed straight forward when I watched the demo at the show. I re-read the directions (more skimmed for the info I needed.) 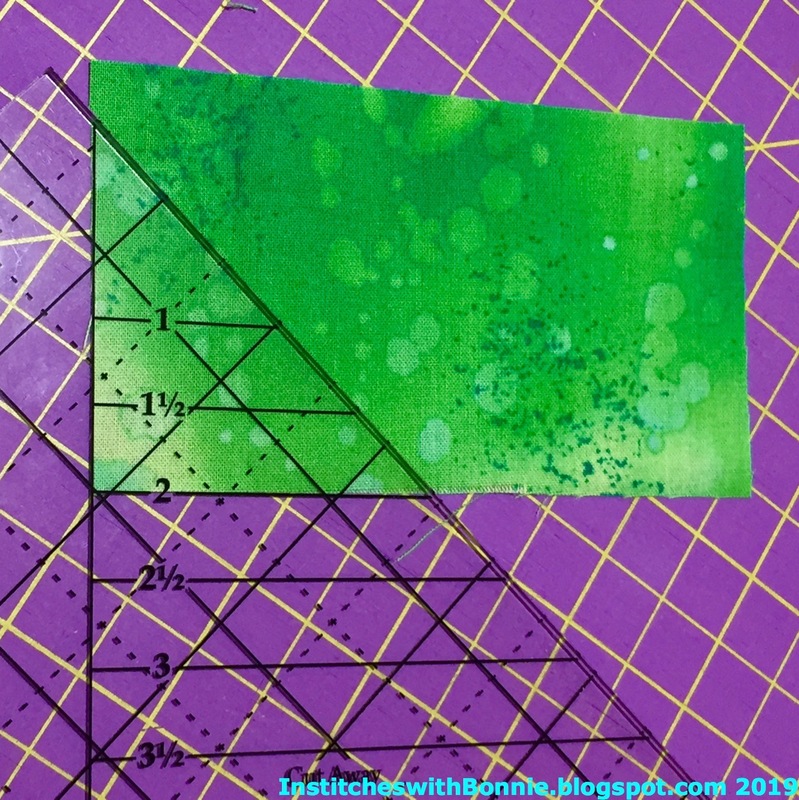 Here's the main process -- cut off the correct amount on the base fabric, cut an enlarged triangle to put on the cut edge and then trim it to the correct size. Sounds easy peasy. And guess what! It definitely is. First I trimmed the excess from where the triangle is going to be placed. This will be the bottom of the heart. The directions were to cut a 2.5" square and mark the center line, sew and then flip. The top of the heart used 1" squares which are too small for the ruler. The directions said to cut a 3.5" square and cut apart on the diagonal. Nothing too hard doing that. Then came the sewing. I actually found the middle of the triangle and the base fabric to make sure it was right. My guess is I didn't need to do that because the triangle was definitely oversized. Check this out carefully. On the upper right is the oversized triangle lined up to cut off the excess. Notice the bottom left triangle that was too small to use the tool. UGH yes it is not making a beautiful 90 degree corner. Sigh. Go back to the top to check out the finished blocks. They really did come out nicely. 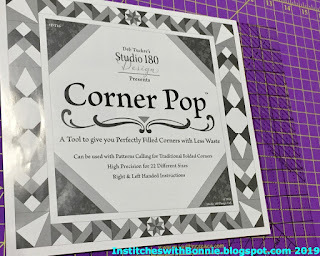 I think I will plan a new quilt using the Corner Pop ruler. Now, what should that new quilt be? Something for the Hands 2 Help project at Confessions of a Fabric Addict? Oh wow! I was just reading about some of her wonderful sponsors. Sarah does such a great job gathering prizes. She's got a lot of new corporate sponsors -- I'm going to make a few quilts! Go sign up if you haven't yet. The center block was in a collection of fabric and projects I got earlier from the estate of a quilter. I'm hoping to send it to Jack's Basket by making it big enough with some borders. I like the the grey and blue but I'll need to bring the center block from 15" to about 36" for Jack's Basket. I have one other blue I'm going to use. Any suggestions on the border? Moving right along, I was pretty successful on my one monthly goal this month. I won't be showing the finish because it is going to be a gift. I'm happy to say I did finish the t shirt top and I was pleasantly surprised at how it turned out. Here's last week's goals list. And here's what I hope to work on this week. That seems like enough to get done. Who knows I may pick a quilt in the closet and quilt it. I find it is easier to store quilt tops rather than finished quilts. So I have quite a collection of quilts ready to be finished. I'm linking up with my favorite linky parties: Oh Scrap, Monday Making, Main Crush Monday, and Moving It Forward. Since I'm posting this on Sunday and not all the blogs are posted, I'll come back and link up as they are available. I'm looking forward to some quiet time doing some blog surfing. I'm also making 3 propeller blocks for each color. I plan to do those as soon as I finish this post. I've been busy reading and working on a quilt I won't be sharing for a while. I've finished the top but won't be quilting it any time soon. I'm linking up with the Rainbow Scrap Challenge and Oh Scrap linky parties. I'll be surfing blogs using these two linky parties to get me started. What a great week! We had a houseful of quilters (and embroiderers) last week. It was fun to spend time with quilting buddies. Sharon came up to have a quilting weekend. Then Dorothy, Kay and Joyce came up to attend embroidery classes. The Richmond gals would leave early each morning and arrive back at dinner time. We would spend an hour or so chatting and seeing what new embroidery things they learned about. The we would eat and get back to gabbing, sewing or whatever struck our fancy. A great weekend. But also tiring! Sharon brought a quilt to throw on Ruthie. Here's the finished top. 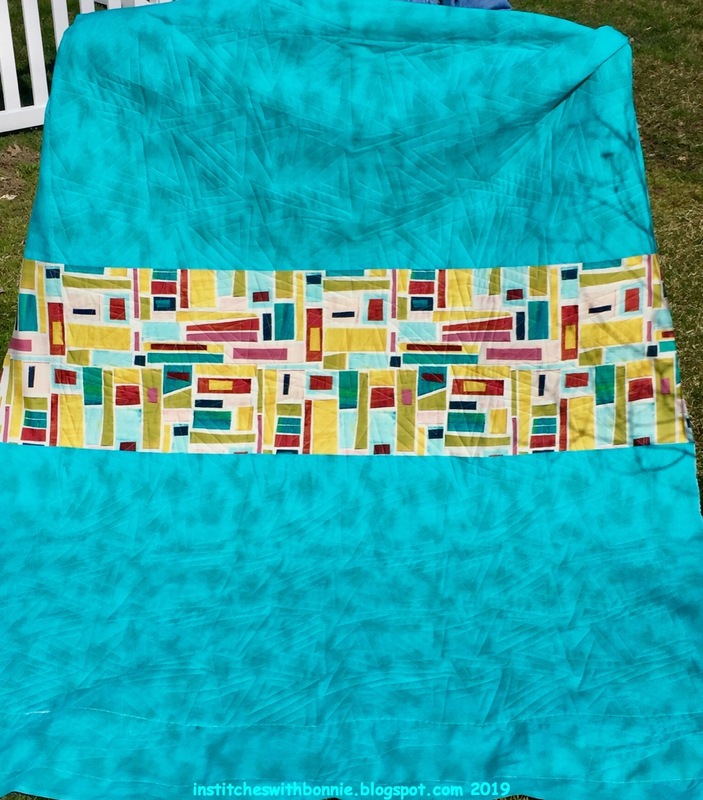 I really like the quilting design she picked, Matrix by Patricia Ritter. We chose to run it fairly large. Ruthy quilted it like a champ. Below shows the backing Sharon put together. Hum, I might have moved my camera while taking it as it doesn't seem sharply focused. 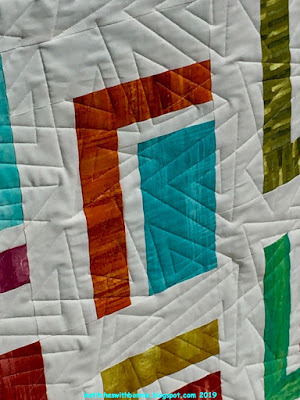 I like that she used the big strip of the border fabric on the back. I'm not to the point of taking pictures of anything I'm currently working on. 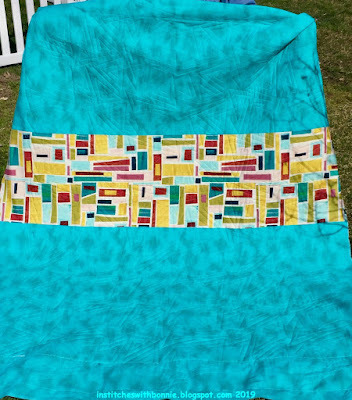 But Sharon helped me with some photos of quilts I've finished over the last month or so. I needed to get pictures done because I was sending two off with Dorothy to take to the Powhatan guild. Today I'm showing Granny Quilt 1. 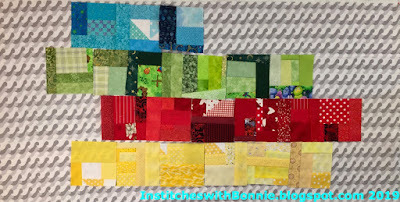 The blocks came from my FCQ Equilters group. This one will go to a nursing home. 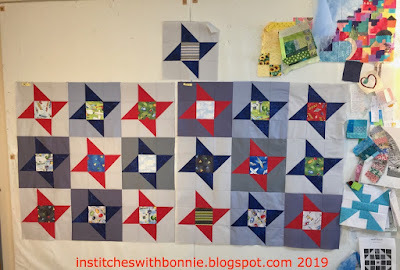 I have enough blocks to make at least one more quilt this size and another one will be a 4 x 6 set that I plan on keeping. 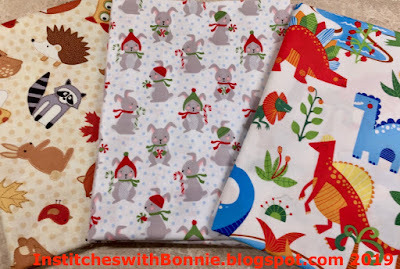 You'll see that brown sashing on all of the quilts as I bought way too much of it! I was tickled to use up a very nice piece of fabric I won from a blog giveaway. I did well on my goals list this week considering all the weekend excitement. Here's what I'll be working on this week. I have about half of the t shirt quilt put together so finishing that will be a priority. I'd like to get other things done but it will just depend on my motivation after my intense quilting time over the weekend. I've been neglecting my blog reading and even responding to the comments I've gotten on my own blog. OOPS. I hope comments on my blog will show up in my email inbox as I've hopefully reset it correctly. Leave me a comment so I can check it out. I'm linking up with my favorite linky parties: Oh Scrap, Monday Making, Main Crush Monday, and Moving It Forward. I'm looking forward to some quiet time doing some blog surfing. I hope you have a chance to also. For now, I'm going to finish posting this and then read some blogs.